Is your outdoor space more drab than fab but you don’t have the inclination (or budget) for a big makeover? Here are eight budget-friendly ways to make it more alluring and comfortable. If you’re in the market for an outdoor table and chair set, consider a circular or oval-shaped table over square or rectilinear. Rounded tables are easier to navigate around and can better accommodate another guest in a pinch. No one likes to sit at the corner during dinner. LBB recommends: Handmade World, Kirti Nagar Market and these furniture markets. Most gardens concentrate on the ground surface, but fences and walls also offer design opportunity. You can even repurpose vintage mailboxes into planters (pictured). 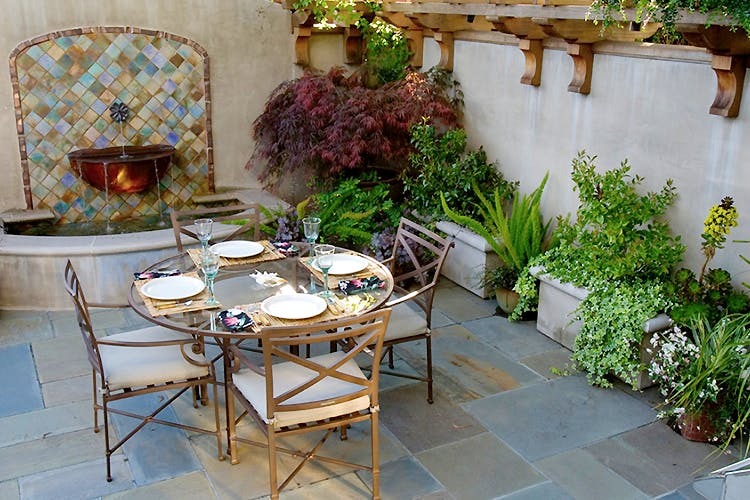 It’s a great use of space on a small patio. Don’t forget about the top of your garden wall, either. Use a layer of wood planters if you have a less-than-desirable view you’d like to screen, want more privacy from neighbours or just want more planting space. Keep in mind that you’ll probably need some carpentry work to support the planters. Here, architectural corbels create a lovely finish to the top of a wall. They’re secured to a wood cap on the wall and support a small trellis running along it. LBB recommends: Balcony Makeovers, MyBageecha, Seth Aunty, The Tree Company or contact the folks at Harame Company. Hopefully your backyard has the sound of chirping birds and buzzing bees; if it doesn’t, incorporating some nature sounds will be good for your mind and soul. The sound of water is not only relaxing but can help mask traffic and other unwanted noise as well. Big-budget landscape projects often incorporate water features, but you can enjoy the same benefits with a smaller, free-standing fountain. Many nurseries sell the components or full kits to create fountains and ponds. If you don’t have space for a fountain or the sound of bubbling water sends you running to the bathroom, a wind chime could be a good alternative. This one, tied to a tree, has an added sculptural effect. LBB recommends: Amazon and Raju’s Pottery Place for water fountains. Wind chimes: Exclusive Lane and Pepperfry. Drapery panels are effective at softening the harsh rays of the sun as well as making your patio a bit more private and cosy. They’re also more flexible than shades, allowing you to shift them left to right as needed. Use an indoor-outdoor fabric, particularly for areas that are exposed to the elements. Sheers are semi-private and soften the hard lines of pergolas and overhangs. While they don’t protect from sun and rain, they can help keep bugs out and add a sense of drama and romance to a backyard space. LBB recommends: Chik store on MG Road, Jagdish Store and these upholstery heavens. String lights can make the saddest of spaces look upbeat. Design options abound, from small to large globes and with or without decorative shades. Our favourite is strung paper lanterns. While paper isn’t an ideal choice for outdoors, you can find these in nylon and in a rainbow of colours and patterns. For maximum longevity, install them in a covered area. A string of flags is always a festive addition to a patio, whether it’s someone’s birthday or not. LBB recommends: Wasted, IDAM and Bhagirath Place. With some creative thinking, you’ll find ways to express yourself beyond your choice of flowers, plants and shrubs. Here, vintage glass marbles have been epoxied to the top of a wrought iron railing. In this backyard space, homeowner Carla Karsakis painted a mural to show off her affinity for Art Deco illustration. If you plan on staying in your house for a while, take that jar of collected rocks, shells and mementos and make it part of your patio wall or floor. LBB recommends: You can get your mementos framed from Sharma Framing House or even from Capital Art Gallery in Khan Market. Decking material, pavers, fencing and home exteriors tend to be neutral, so without some pattern and a punch of vivid colour, your space can look lackluster. These days, indoor-outdoor carpet and area rugs come in a bevy of patterns and colours, like the one shown here. Throw pillows are another easy way to introduce pattern, colour and texture without a lot of commitment. Pillows also make stiff outdoor lounge seating more comfy. LBB recommends: Dilli Haat for dhurries and pillow covers, these Sultanpur decor stores, Freedom Tree and Pulpypapaya for floor cushions. Check your attic, basement and garage for underused pieces that might find new life outdoors. This tiered plant stand spent a previous incarnation as a candle holder. This recommendation was first posted on Houzz.